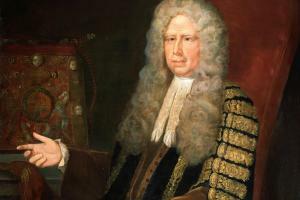 Speaker of House of Commons 16 May 1685–2 July 1687, 20 Mar. 1690–14 Mar. 1695. In the late 1680s Trevor’s former loyalty to James II brought him a temporary reversal of fortune. He only sat in the Convention by virtue of a fortuitous by-election at Bere Alston, Devon, but he was deprived of his mastership of the rolls. Trevor had no intention of vanishing into a political wilderness and successfully set about ingratiating himself with William III and his court. 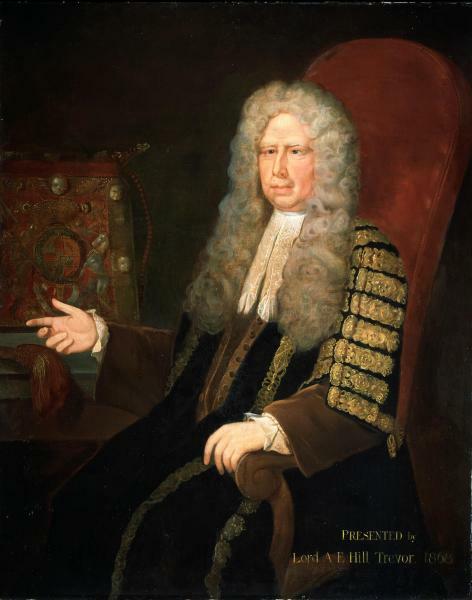 Trevor’s legal background served him well and he was appointed solicitor-general to Queen Mary in 1689, thus giving him access to the ears of the powerful once again. The Convention proved to be a truculent assembly which consistently refused to settle the King’s financial future. Trevor was quick to grasp the possibility of a political comeback, and contemporary reports suggest that he was deeply involved in the process of buying votes for the King in the Commons. He became a self-appointed leader of the Tories during the Convention, and managed to convince the King that elections would result in a more compliant assembly. 1. J. E. Griffith, Peds. of Anglesey and Caern. Fams. 245–55; Frag. Gen. n.s. i. 122; Le Neve’s Knights (Harl. Soc. viii. ), 245; Boyer, Pol. State, xiii. 624; Arch. Cam. 5th ser. i. 213; IGI. 2. A. H. Dodd, Town of Holt, 149; DWB, 980; CSP Dom. 1689–90, p. 367. 3. Portledge Pprs. 74; DNB; Luttrell, Brief Relation, v. 185. 4. Lives of the Norths ed. Jessop, i. 286; DWB, 979–80. 5. Foxcroft, Halifax, ii. 228; Nottingham Univ. Lib. Portland (Bentinck) mss PwA 299a, Ld. Sydney (Henry Sidney†) and Thomas Coningsby* to Ld. Portland, 27 Sept. 1690. 6. Northants. RO, Isham mss. IC 2259, John to Sir Justinian Isham, 4th Bt. *, 20 Mar. ; H. Horwitz, Parl. and Pol. Wm. III, 53; Luttrell, Brief Relation, ii. 326; Chester RO, Earwaker mss CR63/691/82, Sir Willoughby Aston to Sir John Crewe, 3 June 1690; BL, Trumbull Misc. mss. 27, newsletter 3 June 1690. 8. Ibid. 115–16, 125, 160. 9. Ibid. 218; HMC Finch, iv. 512–13. 10. D. Rubini, Court and Country, 96. 11. Luttrell Diary, 337, 457. 13. Som. RO, Sanford mss DD/SF 2980, Edward Clarke I* to Ld. Capell (Hon. Sir Henry Capel*), 23 Mar. 1695 (copy); G. Holmes, Making of a Great Power, 337; Debates and Procs. 1694–5, p. 5; Add. 46527, f. 69. 14. Add. 17677 PP, f. 193; 46527, f. 71; Horwitz, 149; HMC 13th Rep. VI 36–37. 15. Debates and Procs. 1694–5, p. 61; W. C. Townsend, House of Commons, i. 61; Jnl. Brit. Studies, xvii. 2–7; A. Browning, Danby, i. 518–22. 16. Supplement to Debates and Procs. 1694–5, p. 90; Portland (Bentinck) mss PwA 503 [Guy to Portland], 14 June 1695; Horwitz, 149–50. 17. Luttrell, Brief Relation, v. 185; Le Neve’s Knights, 245; DWB, 980.